Note: See maps of proposed uses for the China Bar area near the bottom of the page. The third slide - Maidu Day Use Area - has been recently modified (7/18). The Auburn Dam site, aka China Bar, has essentially been abandoned. The diversion tunnel was closed. The river is restored to its natural channel with whitewater features and opened to the public in 2008. PCWA built and operates a state of the art pumping station. 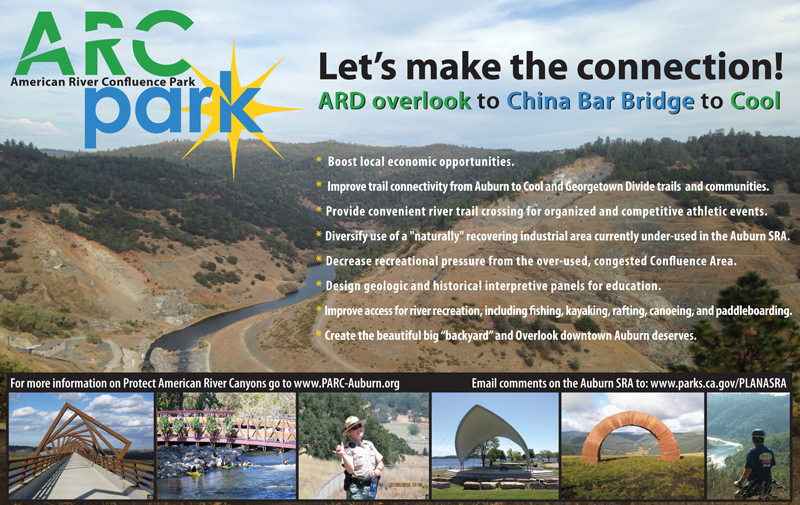 PARC is currently advocating for expanded days use at China Bar and recreational amenities at the former dam site that include a recreational bridge crossing of the river linking the Auburn and Cool Area trails. China Bar is the site of the abandoned Auburn Dam construction project. 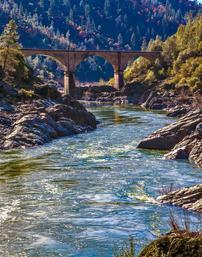 Part of the Auburn State Recreation Area, it lies in the North Fork American River canyon directly below the city of Auburn. In the 40 years since dam construction-related work was halted at China Bar, Auburn SRA has become an extremely popular destination for outdoor recreation enthusiasts. China Bar, however, has remained lightly used, despite its multitude of trails and recreational opportunities. Why doesn’t China Bar see greater visitor usage? Well, for starters, it’s hardly ever open! Despite the existence of a paved road leading deep into the canyon from Maidu Drive in Auburn, the gate to that road is only open to vehicles on weekends from mid-May through the end of September each year. Another road that leads to China Bar from behind the fire station in Cool is never open. We believe these gates should be opened on an expanded basis. The other key component to achieving China Bar’s recreational potential is to construct a multi-use recreational trail bridge across the river, which would connect the network of trails on each side of the river and greatly expand trail options for recreational visitors. PARC has submitted detailed recommendations for China Bar recreational improvements as part of the process currently underway to create a new general plan/resource management plan for Auburn SRA. We also are continuing to lobby for greater vehicle access to China Bar. For details of PARC’s China Bar proposal, click on our July 22, 2016 letter here, with attached map and slides. Pause the slide show in the upper left corner. Scroll through the slides in the upper right corner, or click on the bottom thumbnails. April 10, 2017: The Auburn City Council adopted a resolution protecting the American River and opposing an Auburn Dam. After advocacy from PARC, a presentation by PARC board members Tim Woodall and Deanna Marsh, and strong support from the community, the Auburn City Council voted to adopt a resolution in support of the American River and all the benefits it brings to our communities, and opposing the Auburn Dam.